A glorious evening would begin on a briefly awkward note. Never in my two decades as a performing arts critic have I ever failed to arrive well in advance of curtain time. Nevertheless, last Thursday night a minor pre-show calamity had me arriving at Houston’s Wortham Center at 7:31 p.m. for a 7:30 curtain. The smoothly disciplined house operation of the Brown Theater had closed the orchestra level doors moments before, and I, (along with a considerable group of other unfortunately tardy souls) was quickly escorted by courteous house staff to the upper tier level, where happily, we were permitted to quietly slip into seats of the empty back rows of that uppermost level of the theater to enjoy the magnificent opening scene (the Prologue) of Houston Ballet’s astonishingly beautiful production of The Sleeping Beauty. Thus begins my tale of a night to remember. While distant from the stage, the view and sound levels in that upper tier were actually quite good, with the added thrill of looking down directly to also see the orchestra in the pit (invisible to patrons in Orchestra seating) looking much like a scene in a Hollywood musical. The Prologue reveals a visually enchanting fairytale world in the court of King Florestan (James Gotesky), where the christening of the newborn princess Aurora is being celebrated. The regal attire of the royals (costume and scenic designer, Desmond Heeley) are just the beginning of the stunning parade of exquisite garments that would make every lushly beautiful scene to follow something wondrous to behold. It is as though we are in the finest museum reviewing a series of the art world’s most classic paintings. The dreamlike atmosphere is immediately enhanced by the superb Tchaikovsky score in the brilliant hands of conductor, Ermanno Florio and the Houston Ballet Orchestra. Childhood memories flashed before me on hearing the exquisite “Sleeping Beauty Waltz,” so familiar to those of us who grew up with the delightful Disney animated version that so sweetly converted that waltz to the memorable song, “Once Upon a Dream.” A dream indeed! That is what we have here. And if you don’t believe in fairies, you will after seeing the exquisite dancing of the Prologue’s magical dancing fairies (Nao Kusuzaki, Allison Miller, Jessica Collado, Emily Bowen, Soo Youn Cho) and their gallant cavaliers, splendidly led by Yuriko Kajiya as the Lilac Fairy, and the brilliant Linnar Looris as her cavalier. Alas, enter the evil fairy, Carabosse (Melody Mennite), who places a curse on the child predicting her future death when she would one day prick her finger. Happily the Lilac Fairy softens that curse by promising Aurora will not die, but only sleep until awakened by the kiss of her true love. The Prologue concluded, it was then possible during the intermission to return to our reserved orchestra seating for Act One. This first act brings us further enchantment at the sixteenth birthday party of the Princess Aurora (Sara Webb). 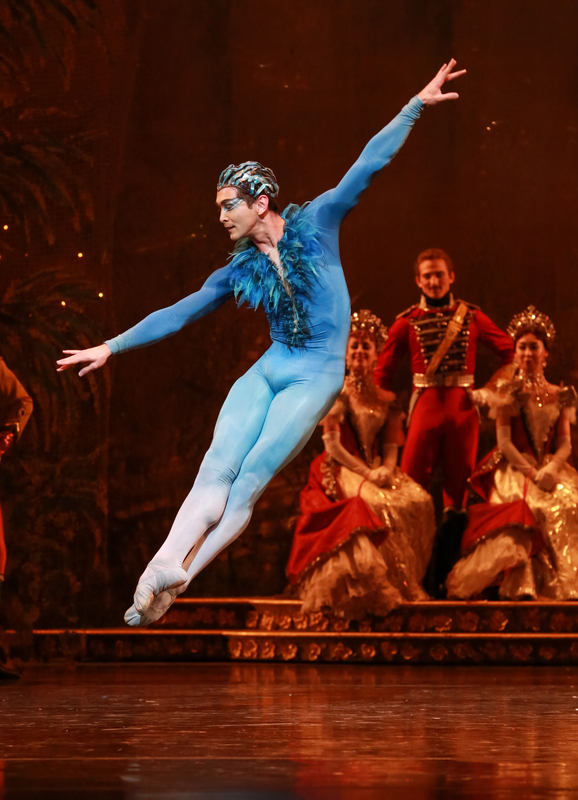 With the stunning choreography of Ben Stevenson (His Sleeping Beauty first debuted here in 1990) joy abounds in every aspect of the celebration, and the glow of Duane Schuler’s original lighting is beautifully recreated here by Lisa J. Pinkham. The scene is notable for the “Rose Adagio” one of the most challenging ballerina solos in all of ballet. 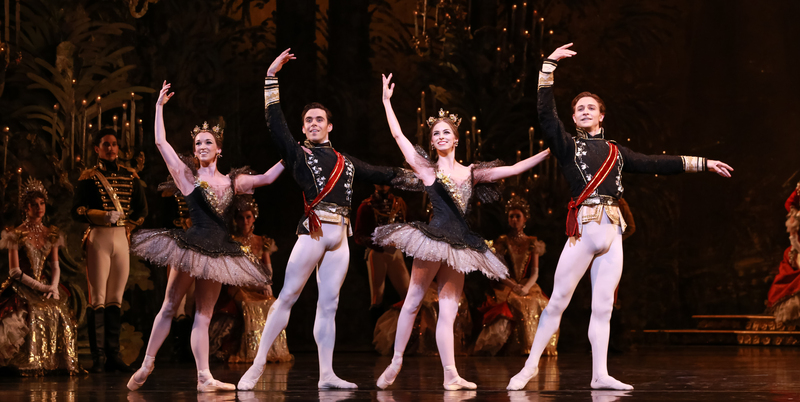 Miss Webb was brilliantly up to this tour de force task as Aurora dances with four princes who each present her with a rose and seek her hand in marriage. (Aaron Sharratt, Linnar Looris, Aaron Robison, and Charles-Louis Yoshiyama). In a series of handoffs she is passed from suitor to suitor as the dance challenges increase in difficulty from the early graceful leg extensions (developee) to the balancing arabesques and on to the supremely difficult en point arabesque when the ballerina is smoothly rotated full circle by each suitor in succession, a feat beautifully realized here by the extraordinary talent of Miss Webb. The sinister Carabosse returns to interrupt this joy by presenting Aurora with a bouquet that conceals the dreaded spindle on which she pricks her finger before falling fast asleep. 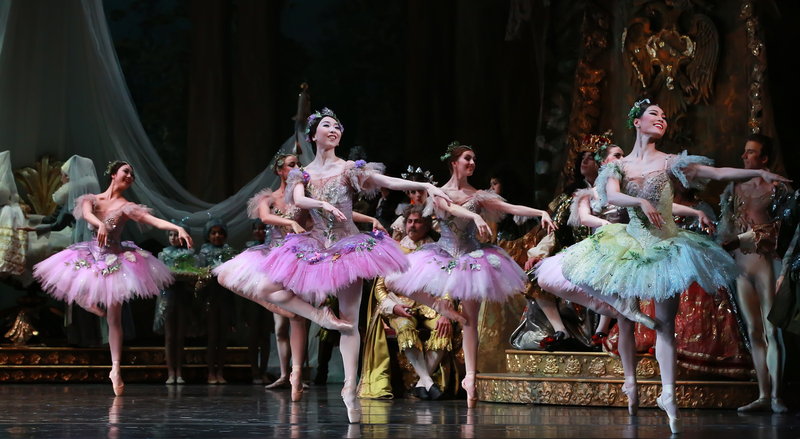 The act concludes as the Lilac Fairy casts a spell to put the entire court to sleep. One hundred years have passed as Act Two gets underway in a lacey and rich green forest that creates the amazing illusion of multilayered depth. Handsome Prince Florimund (Jared Matthews) arrives with his hunting party. 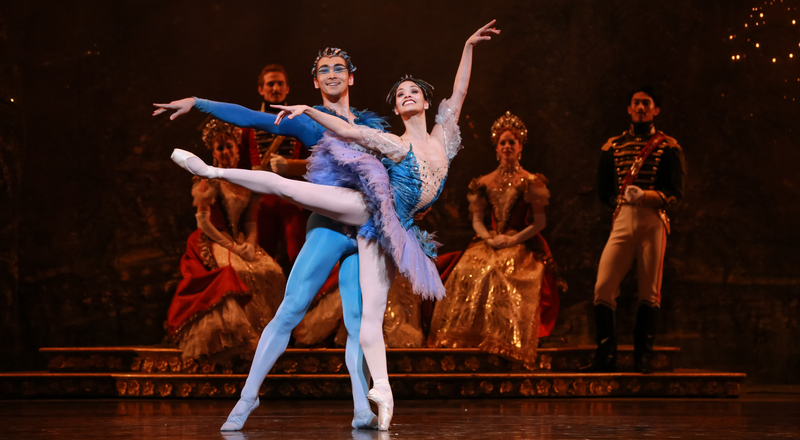 There are charming peasant dances, beautifully executed mirror image choreography from the ensemble Artists of the Houston Ballet, visually stunning tableaus, as well as memorably elegant and athletic pas de deux moments from Matthews and Miss Kajiya. Of course Prince Florimund finally discovers Aurora and awakens her with his magical kiss. That sets the stage for the dazzling wedding celebrations of Act Three with its brilliant Pas de Quatre from dancers Elise Elliott, Allison Miller, Ian Casady, and Connor Walsh. There are astonishing dance displays from Mr. Yoshiyama as the Bluebird and Karina Gonzalez as Princess Florine, delightful Russian dances from The Ivans (Derek Dunn, Christopher Gray & Hayden Stark), and a clear audience favorite in the playful comic gaiety of Natalie Varnum as the White Cat with Harper Watters as Puss-in-Boots. The brilliant full cast Mazurka finale was just icing on the cake of this very magical production. 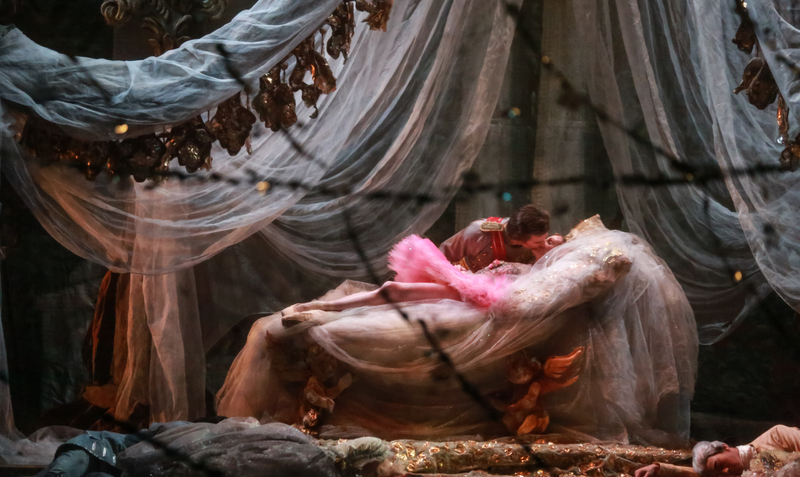 SLEEPING BEAUTY continues in the Wortham Center’s Brown Theater, 501 Texas Avenue in downtown Houston. Remaining performances are at 7:30 pm March 4th and 5th, 1:30 pm on March 5th, and a final performance at 2:00 pm on March 6th. Tickets start at $23 and can be obtained via the website (www.houstonballet.org), at the Wortham box office, or by calling (713) 227 ARTS and 1-800-828-ARTS. 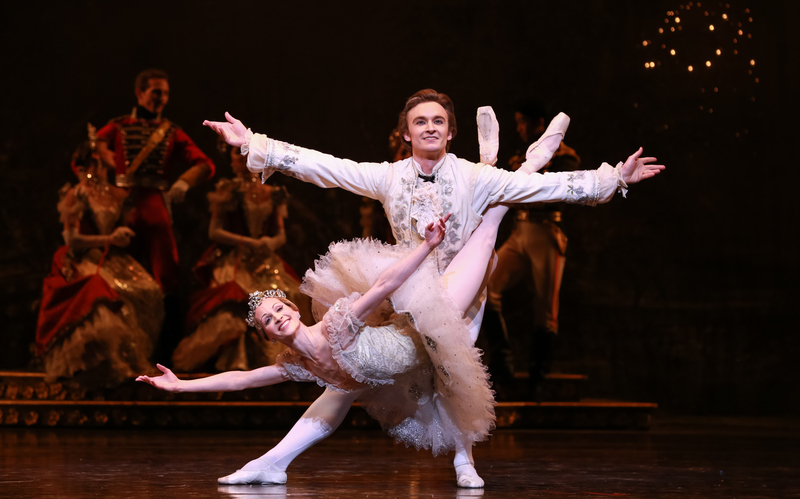 This entry was posted in Ben Stevenson, BroadwayStars.com, Conroe Courier, Ermanno Florio, Houston Ballet, Sleeping Beauty, Tchaikovsky, The Courier Columns, The Villager Columns, ThePeoplesCritic.com, Wortham Center, YourHoustonNews.com and tagged Ballet, Houston Ballet. Bookmark the permalink.